For more than two millennia, forgers have been producing textual forgeries, many of them revolving around aspects of established religion. Among the most consistent facets of this phenomenon is that forgers will often find trained scholars who authenticate their fraudulent fabrications. This lecture will be a case study of some of the most fascinating defenses of textual forgeries and the logic used. This lecture is also part of a forthcoming volume entitled “Forging History in the Ancient World of the Bible and the Modern World of Biblical Studies” (Eerdmans 2018). Professor Rollston earned his MA (1996) and Ph.D. (1999) at The Johns Hopkins University (Department of Near Eastern Studies) in ancient Northwest Semitic Languages and Literatures. He is a member of Phi Beta Kappa. Rollston works in more than a dozen ancient and modern languages, including various ancient Semitic languages (e.g., Hebrew, Phoenician, Aramaic, Palmyrene, Nabataean, Ammonite, Moabite, Edomite, Ugaritic, Akkadian), several ancient and modern Indo-European languages (e.g., Hellenistic Greek, Classical Latin; Modern German, French, Spanish, and Italian), as well as Sahidic Coptic. During the fall semester of 2013, he was a National Endowment for the Humanities Research Scholar at the Albright Institute of Archaeological Research (Jerusalem), and during the spring semester of 2014, he was a Visiting Professor of Northwest Semitic Literature at Tel Aviv University. About a decade prior to this, during the spring and summer of 2002, Rollston was a National Endowment for the Humanities Research Scholar at the American Center of Oriental Research (Amman). 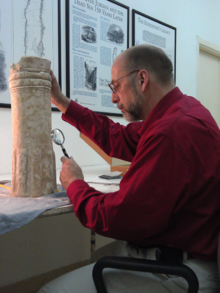 Rollston has excavated in Syria (Umm el-Marra) and in Israel (Megiddo), and he has conducted research at museums and departments of antiquity in Lebanon, Israel, Jordan, and Syria, as well as various museums in North America and Europe. He teaches at George Washington University and is the co-editor with Eric Cline (who has spoken to our society multiple times) of the Bulletin of the American Schools of Academic research (BASOR).